New Jobs Vacancies At Kimpton Hotels. The Kimpton Hotel & Restaurant Group forms part of IHG (Intercontinental Hotels Group). Established in 1981, it is the United States' biggest chain of boutique hotels, with properties around the country and in the Cayman Islands. The Kimpton Hotel and Restaurant Group is a prestigious employer with many listed vacancies in several areas across the hospitality industry, so whether you are looking for new jobs vacancies at Kimpton Hotels & Restaurant to suit experienced candidates or entry level applicants, you are sure to find a suitable role. Why Work For Kimpton Hotels? Where To Find New Jobs Vacancies At Kimpton Hotels? 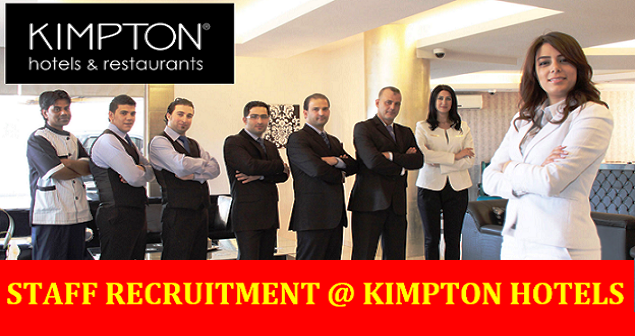 The best place to find new jobs vacancies at Kimpton Hotel is to visit the company's own website. There is a useful careers section which lists all of the current positions vacant across all of the available sectors and across the entire length and breadth of the country. You can search for a job that fits your preferences, customizing your search by state, property, area of interest or city. Jobs with this employer are also often listed on general job websites such as Indeed.com, Glassdoor.com and FlexJobs as well as on industry specialist websites for the hospitality industry such as BestHotelCareers, Hosco.Com and HospitalityOnline. Once you have found a vacancy with this employer that you are interested in, you can apply online for your chosen job. If you have found the vacancy on the Kimpton Hotels website, you will need to register for an account before you can make your online application. What Skills And Experience Are Necessary To Work For Kimpton Hotels? The skills and experience that you will need to work for this employer will vary greatly, however for entry level posts, the basic level of education you will require is a good high school diploma. You will usually need to have good customer service skills as well as a positive attitude and an excellent level of communication skills in both written and spoken English.